Original Editors - Michelle Quill from Bellarmine University's Pathophysiology of Complex Patient Problems project. A benign osteoblastic tumor consisting of vascular osteoid tissue centrally called the Nidus and sclerotic bone peripherally. Osteoid Osteoma does not grow or behave in a locally aggressive manner, and it has no potential for malignant transformation. May initially appear on a radiograph as a small sclerotic bone island within a circular lucency.It is classified as a stage I (latent) bone tumor. In >50% of cases, the lesion occurs in the metaphysis and diaphysis of the long bones, particularly the femur and tibia. Other anatomic sites of involvement include the spine, upper extremity, pelvis, sacrum, ribs, hands, and feet. Osteoid osteomas account for 1/8 to 1/10 of symptomatic bone tumors and 5% of all primary bone tumors. Osteoid osteomas are the 2nd most common benign primary bone tumors resulting in 10-12% of all benign tumors. Osteoid osteomas occur in children and young adults between the ages of 7 and 25. All ages can be effected but 75-80% of patients are less than 25 years of age. The male to female ratio is 2-3:1 putting boys and young males at the greatest risk for developing osteoid osteomas. Due to the age of onset osteoid osteomas can easily be mis-diagnosed as a musculoskeletal disorder because when someone in their twenties reports pain, the vast majority of people assume the pain is musculoskeletal in nature. The true diagnosis is easily overlooked because epiphyseal lesions mimic intra-articular derangement and pain is typically localized to the site of the lesion, so the location of pain can be anywhere, and may coincide with common sites of musculoskeletal inflammation or strain.Another reason diagnosis is easily misled is that pain usually occurs before the lesions are visible on radiographs and in the early stages can be easily missed on a radiograph.Finally, these lesions may be associated with proliferative synovitis due to prostaglandin secretion that decreases range of motion, creates joint effusion, and can mimic inflammatory arthritis. Pain caused by osteoid osteomas can be relieved with aspirin and NSAIDS, which inhibit the prostaglandins released by the tumor cells. Prostaglandins cause changes in vascular pressure, which stimulates sensory nerve endings locally, causing pain. Inhibition of these prostaglandins relieves pain. . Few studies have shown lasting affects of syptom relief after long term use of NSAIDS, some studies have shown without surigical management there is a probablity of evoltion into a osteoblastoma. An osteoid osteoma can also be detected with bone scan, or scintigraphy, which will show a focal uptake of the radiotracer by the tumor.Scintigraphy is often used to detect an osteoid osteoma that is not easily seen on a radiograph, such as a vertebral tumor. Overall, CT scans are the best imaging tool for diagnosing osteoid osteomas. 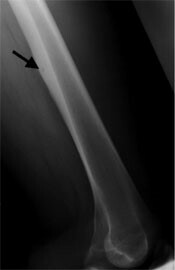 •This is an X-ray of an osteoid osteoma of the thigh(femur) with increased bone formation and subtle lucency(arrow). 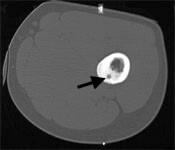 •This is a CT scan of an osteoid osteoma of the thigh(femur), a small, round lytic focus(arrow) surrounded by dense bone is demonstrated. • This is an MRI of an osteoid osteoma of the thigh(femur). There is increased bone formation(dark)surrounding a brighter spot. The bright spot represents the nidus(arrow)of the osteoid osteoma. The actual cause of osteiod osteomas is unknown. The nidus has been found to contian abundant nerve fibers within its matrix, adjacent to areas rich in arterioles. Prostoglanden synthesis has been shown to occur in the nidus. These reports suggest an important pathophysiologic role for prostaglandins both as mediators of pain and vasodilation that may stimulate the nerve endings by increasing the blood flow within the tumor. An osteoid osteoma is a vascular lesion consisting of an area of immature bone surrounded by osteoblasts and osteoclasts. The tumor starts with the nidus, or nest of vascular osteoid tissue in the center of the tumor. The nidus then becomes surrounded by reactive bone sclerosis. After the removal of the nidus, the secondary bone sclerosis generally disappears gradually. Systemic involvement is uncommon with an osteoid osteoma. 1.Open Excision- intraoperatively cut out tumor, difficult for surgeon, hard to see. Can result in longer hospital stay for patient with activity and weight bearing restrictions. Oldest method. This is a link to a slide show containing three examples of different presentations of Osteoid Osteomas. Great review of the literature specific to osteoid osteoma of the foot and ankle. ↑ 1.0 1.1 1.2 1.3 1.4 1.5 1.6 1.7 1.8 1.9 Atesok KI, Alman BA, Schemitsch EH, Peyser A, Mankin H. Osteoid osteoma and osteoblastoma. The Journal of the American Academy of Orthopaedic Surgeons. https://www.ncbi.nlm.nih.gov/pubmed/22052644. Published November 2011. ↑ 3.0 3.1 3.2 Goodman, Snyder. Differential Diagnosis for Physical Therapists: 5th Edition. Screening for Referral. St. Louis, Missouri: Saunders Elsevier; 2013. ↑ 4.0 4.1 4.2 4.3 4.4 4.5 4.6 4.7 4.8 4.9 Goodman CG, Fuller KS. Pathology: Implications for the Physical Thearpist, 4th Edition. St. Louis, Missouri: Saunders Elsevier; 2014. ↑ 5.0 5.1 Atar D, Lehman WB, Grant AD. Tips of the trade. Computerized tomography--guided excision of osteoid osteoma. Orthop Rev. Dec 1992;21(12):1457-8. ↑ 8.0 8.1 8.2 8.3 Osteoid Osteoma: Symptoms, Causes & Treatment. UCSF Radiology. https://radiology.ucsf.edu/patient-care/services/osteoid-osteoma#accordion-imaging-of-osteoid-osteoma. Published February 23, 2016. Accessed April 10, 2017. ↑ Pettine KA, Klassen RA. Osteoid-osteoma and osteoblastoma of the spine. J Bone Joint Surg Am. Mar 1986;68(3):354-61. ↑ Frassica FJ, Waltrip RL, Sponseller PD, et al. Clinicopathologic features and treatment of osteoid osteoma and osteoblastoma in children and adolescents. Orthop Clin North Am. Jul 1996;27(3):559-74. ↑ P. osteoid osteoma. YouTube. https://www.youtube.com/watch?v=G4JJv1dhEa0. Published July 30, 2016. Accessed April 10, 2017.